He hopes Blank won’t notice that embarrassing message. Ugh, children! Astute readers may notice that Blank’s font suddenly changed. Someone notified us that it was really annoying to read. What I liked about his former font was it had the violent urgency of someone slashing away at the paper, but this one also fits him I think because it’s kinda dorky looking. HAHA! The last three panels are amazing. Out of curiosity, why is green used to show embarrassment? I remember seeing this color on expressions used only like once before, (that I can recall), when it was used on Skarva. Queasiness as well, I think. The physics of sharkman and human together would make me want to puke too, if I was one of them. Didn’t think Blank’s font was THAT hard to read, certainly not enough to warrant a change, but oh well. Like the new angle Tiberius is going for. He’s trying so hard not to be a jerk. I didn’t either, but as it was enough to warrant a complaint from someone, I didn’t mind changing it, especially considering that he’s been in so few comics. Admittedly, I did resist a bit, because a character’s font reflects them and I put thought and love into choosing each one, but I found another that I think works. Yep, and that was right after Davis gave him the ol’ puppy dog eyes. The overpowering cuteness made him want to barf… and yet he couldn’t resist it. 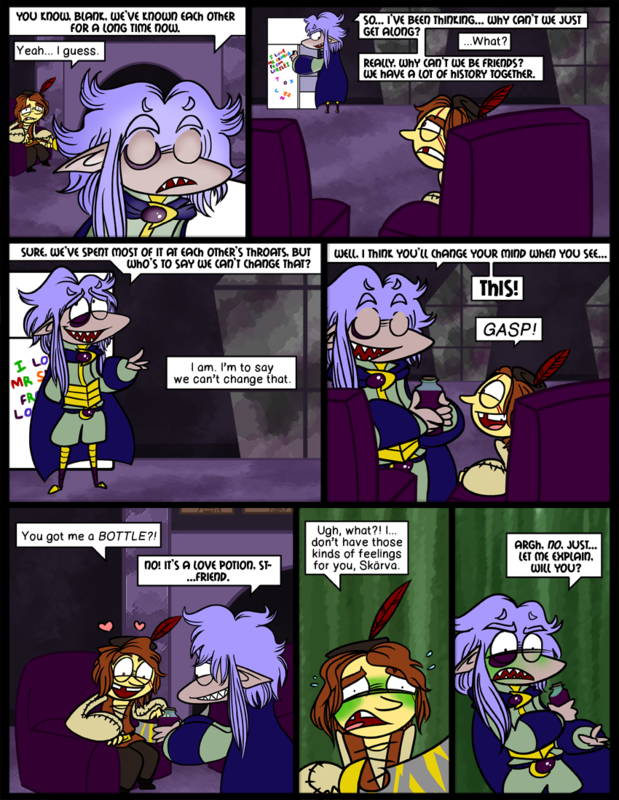 At first I thought that the hero must have really low standards to get so excited about getting a glass bottle, and to the point even of not being suspicious of Skarva’s sudden change of heart. You don’t know how long I’ve been wanting to make a bottle-related joke. I convinced Victor to throw this one in there. i hate when deviant art does that..
“xedwast one” says Captcha. Sounds crazy! Shh. If Skärva or Blank find out, they will NOT be happy. And you won’t like them when they’re not – ok, you probably would. In fact everybody does like Skärva when he’s not happy. Lol Skaerva is best when he’s angry actually. Blanks say “<3<3" when they get bottles all the time! You can do it, Skärvy! We want you to win! Ahhhhh the bottle. The most scared of all gifts. Only 4 of them exist in Idenau at a given time. Pretty much. Copious to excessive amounts of unhammer-spaceable waterskins, perhaps? It’s just that… well aside from the whole aspect of them hating each other, which I realize won’t deter anybody (it’s actually kind of exciting, I know), Blank is far too rigidly moral and one-track-minded, and essentially just too dull, to arouse any kind of interest from Skärva’s vicious intelligence and moody passions – the very reason why Veronika won’t date him either. Man, arguing logic with shippers is somewhere in the endless list of pointless things to do on the internet. You’ll never win. Arguing on the internet in general is something I have found to be pointless most of the time. ^_^; But these are my babies, if anything, I just like talking about them! Haha, I understand the restraint you’re going through. I have to not ship my characters with other characters (my heroine’s stepmother canNOT have a fling with the heroine’s half-brother, no matter how hot he is…), so I understand. And I don’t think I could see anyone being shipped with Lorelei, honestly. Though I did draw a really awesome picture (if you’ll excuse my ego) of her for Kelly Nelly’s birthday today. I’m planning a large group-portrait-type fanart for your 1-year anniversary. :O You’re the best! I’m so excited! I don’t think any of you awesome people would try to twist sweet innocent Lorelei into anything but the friendship and pseudo-familial love that she feels so strongly, but I have no doubt that were our fandom larger, well… I mean you get people who ship ANYONE with ANYONE in big enough fandoms, we’d have LoreleixFrozio and BlankxVeronika’s bird and DerkxLomurcio’s hat. Yeah, the larger a fandom is, I’ve noticed, the weirder the ships are. “Relationshipping”, or just “shipping”, is slang for pairing up characters. Oh Barty, how innocent you are! I’m glad somebody finally appreciated that comment. Pearl of Wisdom: People will most likely except your ideas if you say Benjamin Franklin said it. ya i liked the old font, i didnt think it was hard to read. i thought it showed his noble hero-ness. oh well. Yeah, it does seem a little weird looking at Blank’s speech bubbles and seeing something else. Of all the main characters though, he’s probably the only one whose “voice” I could bear to change. I like my little Blank and he’s pitiable and vulnerable in his own ways, but I must admit I’m the least attached to him, probably because he’s intended to be the most bland and archetypal and satirical, and his humor and the way we understand him as a character comes from that, less from him having his own personality. It’s possible, depending on how you used the brackets, that it was interpreted as being some kind of html code. Hilarious! last three panels had me in hysterics! oh, and roveros inter mix. im kinda late for this one. Yeah, I was wondering when you would show up. Blank drinks half the potion, trips, and Skarva or somebody (anybody really) else drinks the other half. Suddenly backfired. Blank distrusts Skarva or finds the idea repugnant (the latter part is doubtful, as Blank is a satirical of the standard videogame hero, which, even though they rescue people, they only really do it for the free items). The vial was mixed incorrectly or shenanigans happen and the princess falls for Skarva instead, permanent-like. The princess was destined to fall for Skarva inevitably, or already fell for Skarva, and this removes one of the few pleasant portions of Skarva’s destiny, and Blank continues being a hero ANYWAY, thus resulting in this entire plan being a misfire. The princess actually has multiple personality/form disorder (due to a curse) and is holding it back by her whole ‘meh’ outlook, thus restraining herself from becoming various monsters. When her emotions are pushed out, her form changes as well as her attitude almost unpredictably and dangerously. Oh my, such detail. I love it! Somehow I don’t think Skärva would view a scenario where Veronika ended up falling for him as a misfire. Remember that he’s tried love potions on her before, but they’ve never worked. He views this as being a result of the whole gods-hating-him complex which prevents him from using sacred items (like the Orb of the Gods) as well. The gods would never allow their beloved princess to fall in love with the accursed blight on humanity that is a Skärva. That’s why this time, he’s not wasting the most powerful love potion he’s ever brewed on himself. BUT if the princess suddenly revealed her adoration for Lord Quadrobrow McSkinnylegs (…wtf) and his luxuriant hair, you can bet that he would take that easy route to eventually marrying her and ruling Idenau and bullying Blank into letting Veronika have what makes her happy. Hm, well, there goes one suspected plot development down the drain. Though, I have to say, I like it better that you’re avoiding that route. What I do find odd is that you imply the gods see Skärva as a blight upon humanity? Really, fictional gods of Idenau? He’s a pathetic nuisance, at worst. Surely there are worse people in this world ruling/threatening it much more subtle ways. Well, no one ever said the gods themselves are just or fair. In fact that’s a very big part of our overall story. These are the same gods, remember, that relegated an entire line of descendants to misfortune and physical deformity because of the actions of one man. Few, even his descendants, would deny that Tiberius the First deserved “blight upon humanity” status, but his offspring are the ones who have suffered the most for it. Not to mention they’ve barred certain humans from entering the afterlife (all the humans who served the First, including Ecta). Those were all different possibilities. And yes, I figured that, but it’s funner to list plot twists I see potentially occurring. Having the royal families princess be secretly cursed into becoming a monster or simply having MPD is an amusing concept to me that occurred at the very end. Thank you for your approval and response. Pffft, silly! It’s me and Victor who are always looking for our audience’s approval. Thank YOU for taking the time to comment, and thinking about our characters in depth! LOVE their expressions about the idea too, freakn’ hilarious. Again, best part is the bottle joke. Soo true; playing Zelda, you get so ravenous over every little glass container you can get you heroic hands on. And I just love how Blank exemplifies that wonderfully here. He almost looked like he was ready to be friendly.